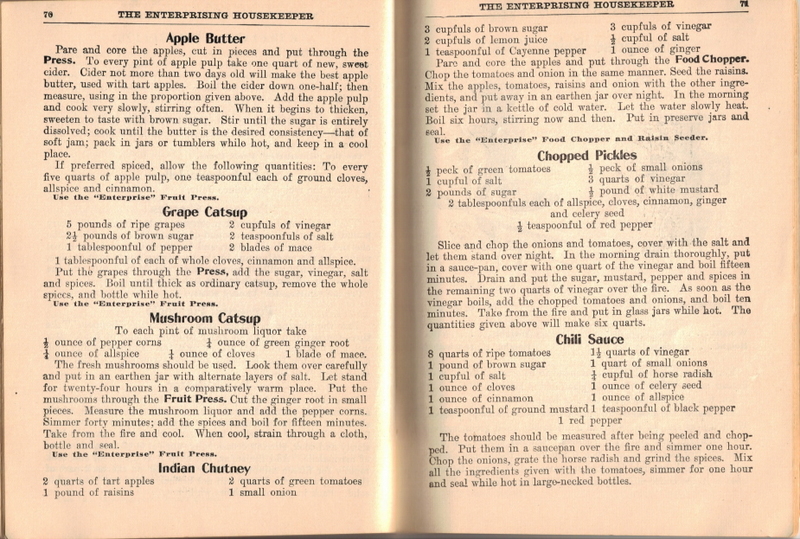 Here are pages 68, 69, 70 and 71 from the vintage booklet The Enterprising Housekeeper from the sixth edition (1906). There is no “royal road” to nice things. 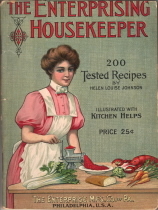 To have them the housekeeper must take time and trouble, and yet much of both she can save herself by the use of proper utensils. 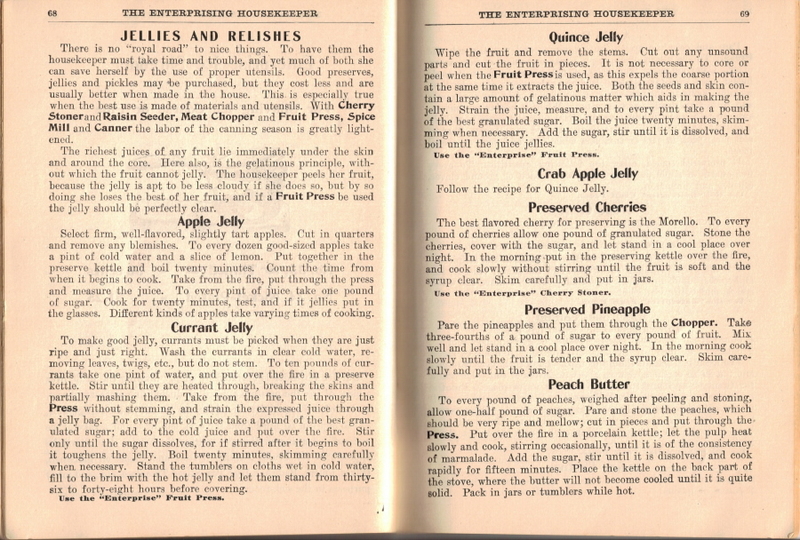 Good preserves, jellies and pickles may be purchased, but they cost less and are usually better when made in the house. This is especially true when the best use is made of materials and utensils. With Cherry Stoner and Raisin Seeder, Meat Chopper and Fruit Press, Spice Mill and Canner the labor of the canning season is greatly lightened. The richest juices of any fruit lie immediately under the skin and around the core. 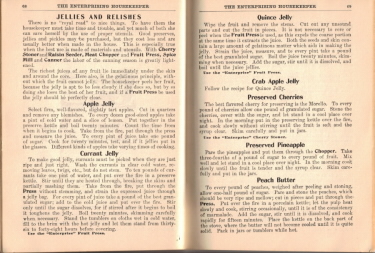 Here also, is the gelatinous principle, without which the fruit cannot jelly. 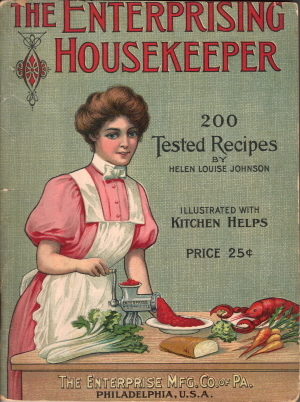 The housekeeper peels her fruit, because the jelly is apt to be less cloudy if she does so, but by so doing she loses the best of her fruit, and if a Fruit Press be used the jelly should be perfectly clear. Select firm, well-flavored, slightly tart apples. Cut in quarters and remove any blemishes. To every dozen good-sized apples take a pint of cold water and a slice of lemon. Put together in the preserve kettle and boil twenty minutes. Count the time from when it begins to cook. Take from the fire, put through the press and measure the juice. To every pint of juice take one pound of sugar. Cook for twenty minutes, test, and if it jellies put in the glasses. 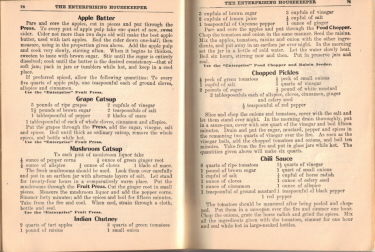 Different kinds of apples take varying times of cooking. To make good jelly, currants must be picked when they are just ripe and just right. Wash the currants in clear cold water, removing leaves, twigs, etc., but do not stem. To ten pounds of currants take one pint of water, and put over the fire in a preserve kettle. Stir until they are heated through, breaking the skins and partially mashing them. Take from the fire, put through the Press without stemming, and strain the expressed juice through a jelly bag. For every pint of juice take a pound of the best granulated sugar; add to the cold juice and put over the fire. Stir only until the sugar dissolves, for if stirred after it begins to boil it toughens the jelly. Boil twenty minutes, skimming carefully when necessary. Stand the tumblers on cloths wet in cold water, fill to the brim with the hot jelly and let them stand from thirty-six to forty-eight hours before covering. Wipe the fruit and remove the stems. Cut out any unsound parts and cut the fruit in pieces. It is not necessary to core or peel when the Fruit Press is used, as this expels the coarse portion at the same time it extracts the juice. Both the seeds and skin contain a large amount of gelatinous matter which aids in making the jelly. Strain the juice, measure, and to every pint take a pound of the best granulated sugar. Boil the juice twenty minutes, skimming when necessary. Add the sugar, stir until it is dissolved, and boil until the juice jellies. Follow the recipe for Quince Jelly. The best flavored cherry for preserving is the Morello. To every pound of cherries allow one pound of granulated sugar. Stone the cherries, cover with the sugar, and let stand in a cool place over night. In the morning put in the preserving kettle over the fire, and cook slowly without stirring until the fruit is soft and the syrup clear. Skim carefully and put in jars. Pare the pineapples and put them through the Chopper. Take three-fourths of a pound of sugar to every pound of fruit. Mix well and let stand in a cool place over night. In the morning cook slowly until the fruit is tender and the syrup clear. Skim carefully and put in the jars. To every pound of peaches, weighed after peeling and stoning, allow one-half pound of sugar. Pare and stone the peaches, which should be very ripe and mellow; cut in pieces and put through the Press. Put over the fire in a porcelain kettle; let the pulp heat slowly and cook, stirring occasionally, until it is of the consistency of marmalade. Add the sugar, stir until it is dissolved, and cook rapidly for fifteen minutes. Place the kettle on the back part of the stove, where the butter will not become cooled until it is quite solid. Pack in jars or tumblers while hot. Pare and core the apples, cut in pieces and put through the Press. To every pint of apple pulp take one quart of new, sweet cider. Cider not more than two days old will make the best apple butter, used with tart apples. Boil the cider down one-half; then measure, using in the proportion given above. Add the apple pulp and cook very slowly, stirring often. When it begins to thicken, sweeten to taste with brown sugar. Stir until the sugar is entirely dissolved; cook until the butter is the desired consistency–that of soft jam; pack in jars or tumblers while hot, and keep in a cool place. If preferred spiced, allow the following quantities: To every five quarts of apple pulp, one teaspoonful each of ground cloves, allspice and cinnamon. 1 tablespoonful of each of whole cloves, cinnamon and allspice. Put the grapes through the Press, add the sugar, vinegar, salt and spices. Boil until thick as ordinary catsup, remove the whole spices, and bottle while hot. The fresh mushrooms should be used. Look them over carefully and put in an earthen jar with alternate layers of salt. Let stand for twenty-four hours in a comparatively warm place. Put the mushrooms through the Fruit Press. Cut the ginger root in small pieces. Measure the mushroom liquor and add the pepper corns. Simmer forty minutes; add the spices and boil for fifteen minutes. Take from the fire and cool. When cool, strain through a cloth, bottle and seal. Pare and core the apples and put through the Food Chopper. Chop the tomatoes and onion in the same manner. Seed the raisins. Mix the apples, tomatoes, raisins and onion with the other ingredients, and put away in an earthen jar over night. In the morning set the jar in a kettle of cold water. Let the water slowly heat. Boil six hours, stirring now and then. Put in preserve jars and seal. Slice and chop the onions and tomatoes, cover with the salt and let them stand over night. In the morning drain thoroughly, put in a sauce-pan, cover with one quart of the vinegar and boil fifteen minutes. Drain and put the sugar, mustard, pepper and spices in the remaining two quarts of vinegar over the fire. As soon as the vinegar boils, add the chopped tomatoes and onions, and boil ten minutes. Take from the fire and put in glass jars while hot. The quantities given above will make six quarts. The tomatoes should be measured after being peeled and chopped. Put them in a saucepan over the fire and simmer one hour. Chop the onions, grate the horse radish and grind the spices. Mix all the ingredients given with the tomatoes, simmer for one hour and seal while hot in large-necked bottles.